Combining research and conservation is a crucial step to saving species. Jennifer Moore, Associate professor at Grand Valley State University is working with her students to conserve countless amazing reptiles. We had a chance to chat to her about her experience with reptiles and more about her current work. What is your current position and what is your research focus? I am an associate professor at Grand Valley State University in southwest Michigan and that mostly includes teaching and research. I have a variety of projects that I am working on at present. Most of them are conservation based and focused on reptiles. One of my main projects that I am working on with my students is with the massasauga rattlesnakes. It is a federally threatened species in the U.S.A. and we have done some work on the conservation and management of the species. Some of the research has centered around the genetic diversity of these snakes, especially in small and isolated populations. We’ve looked at modelling their occupancy to understand more about their status and where they still exist, based on historic and present data. We also have several turtle projects going which focus on spatial ecology, how turtles use their environment and understanding more about their population demography. I enjoy using various molecular and genetic techniques to answer questions in my research, but I also use many traditional ecological techniques. How did you end up working in conservation and herpetology? When I was growing up I was fascinated by reptiles. I grew up in Michigan and there are many wonderful wetlands here and lots of streams and lakes. I used to enjoy finding reptiles and at some point, I found out that you could actually make a career out of it. Reptiles as a group are declining on a local and global scale and that solidified my interest to work in conservation and try to protect species and populations. That eventually led me to an academic path, researching and working with animals that I always loved. I’ve always really liked research and as a scientist I kept asking questions that needed answers. Research and academia was the main route to answer all those questions. It had also been a struggle outside of academia to find positions where I could continue to do research. Currently, I do work closely with the U.S. Fish and Wildlife service and other management agencies to make sure the research that we do is implemented in some way and that the questions we answer are helpful to the management of a species in some way. In terms of education, I started off as a pre-vet major but quickly realized that it was not for me and so I switched to a zoology major during my undergraduate. I then did my masters working on the massasauga rattlesnakes and that sparked my interest in working with them. It was my first experience with research and working on reptiles which was really cool! Before I knew it, I was off to New Zealand to do my PhD working on the Tuatara, which is also of huge conservation concern. It was another great experience doing research on a reptile, so I did a few Post-docs and then landed my position at Grand Valley State University. Are there any success stories you would like to share with us? I’ve worked with the massasauga rattlesnakes for 15 years and back in the early days, they were only a candidate for federal listing. They were finally listed under the endangered species act about 2 years ago. I’m hoping that will put more focus on these snakes and we have seen more people interested in the management and conservation of the species, so it can potentially be a success story. The work I did with tuatara is a real success story. Tuatara are really quite a unique reptile and they were completely wiped off the mainland of New Zealand, to which they are endemic. They only occur naturally on the small offshore islands, where the populations were not doing too well. Efforts to conserve the species really grew and when I started my PhD, they had established translocation tools that worked really well for the tuatara. Researchers went onto an island, eradicated the mammalian predators and reintroduced tuatara. This technique worked well, and I was able to be a part of some of the translocation work and the captive breeding work. Why do you believe snakes are important? Often when a random person that doesn’t know much about snakes asks me that then I have to relate it back to humans and find a story based on research. For example, there was a study showing how snakes are great for reducing tick populations because they eat rodents that attract the ticks. Snakes provide an ecological service and it is important for people to make that connection. As a conservation biologist I explain their importance in their role within ecosystems, both as predator and prey. Some of the species that we work on are living in ecosystems such as wetlands, which need to be maintained as the special ecosystems that they are, but also so they can continue to provide ecosystem services (like flood protection) for us. How do you think snake conservation can be improved? Through public education and public awareness. Snake conservation can be challenging because we don’t know much about them as they are such a secretive group of animals. It is much harder to conserve a species that you don’t know much about. Improving our knowledge of snakes is important if we want to contribute to their conservation. As a HERPer, how do you inspire other female herpetologists? Having important role models can really be helpful as a start. It is also really good to just get out there, talking about your work and sharing experiences so that you can show other women that you can make it. I try to do that with women in my life, sharing my experiences and encouraging them to do anything they want to. Herpetology has traditionally been a very male dominated field but that is changing so mentoring women and showing them that they can make it is important. Why do you think the work Save The Snakes does is important? Anyone trying to advocate snakes is doing a great job and snakes as a group are amazing but hard to sell because there is a hatred towards them. Save the snakes is doing a huge service to create an appreciation for them, mitigate human-snake conflict and that’s important. If you had to choose a favorite herp/reptile, what would it be? So many to choose from… But definitely the massasauga rattlesnakes at the top of the list! 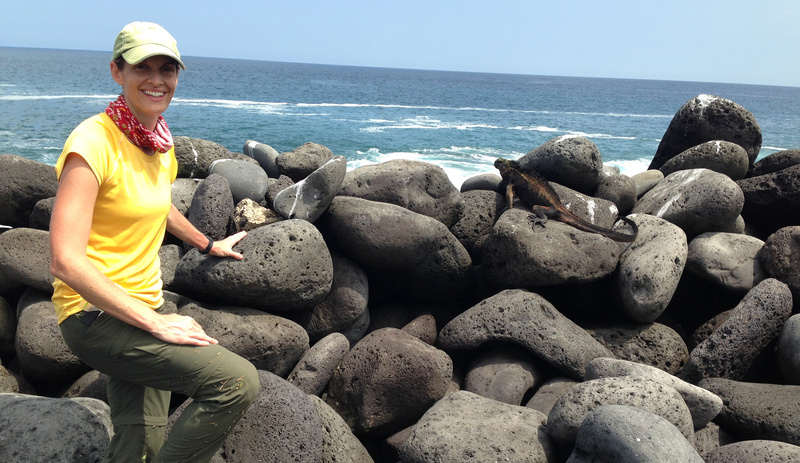 Others include the Blanding’s turtle, Marine Iguanas and Tuatara.